Silver pearl jewelry show us not just fashion, but a fine piece of silver pearl jewelry highlighting the mood, personality and elegance of a woman. The current versatile designs of silver pearl jewelry offer the wearer a wide range of styles to match every outfit, be it daytime chic or evening elegance. 1 .Intriguing necklace in multi-strand sterling silver chains with dangling round and match with freshwater teardrop pearl. 2. 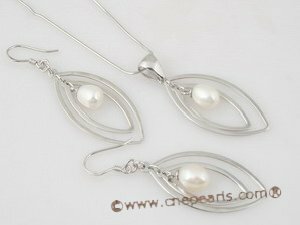 Sterling silver Jewelry set featuring dangling saltwater pearls in oval-shaped pendant and earrings . 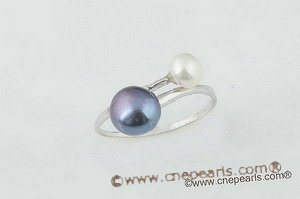 4.With classic black and white pearls and sterling silver, this ring bring us back to the Audrey Hephurn’s time. 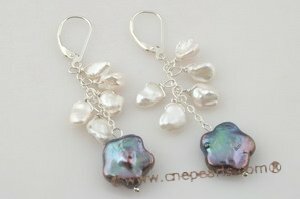 This page contains all entries posted to wholesale jewelry,pearl jewelry,cultured pearls in August 2009. They are listed from oldest to newest.